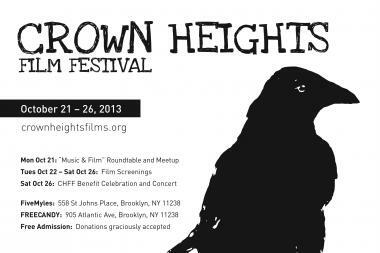 The soundtrack takes center stage at this year's Crown Heights Film Festival, Oct. 21-26. CROWN HEIGHTS — This year, it's all about the beats. Monday marked the launch of the fourth annual Crown Heights Film Festival, a shorter, sharper version of last year's 10-day event with a special emphasis on movie music, organizers said. "Music is another character in any film, just like location is a character," said festival co-founder Erin Gleason. "The thing we’re trying to do ... is not just talk about the conceptual or artistic value of music in film, but to actually introduce people who either are musicians, or whose films emphasize the music in a certain way, to help other filmmakers understand the ins and outs of it." Leading the six-day festival is filmmaker and musician meet-up at Five Myles Gallery on St. Johns Place, followed by five days of film screenings at Five Myles and a closing party at Free Candy on Atlantic Avenue. "One of the things we try to do at the film festival is to create opportunities for filmmakers to meet and collaborate with other people in the film industry and the arts," Gleason said of the opening day roundtable. "Our panel is on music in film, and it’s also a meet-up." Though the week-long fest keeps screenings local, films come in from all over — including a glut of submissions this year from Iran. But whether submissions come from around the corner or around the world, the themes are often the same, Gleason said. "There are a lot of films this year about place-making, architectural development, gentrification and issues like that. We also have a lot of narrative short that deal with issues of identity, whether racial identity and gender identity," Gleason said. "We never know what’s going to come in, so to curate that has been a lot of fun."